Stay right where you want to be - on the beach! This is a small building complex that provides a beach-front location with a security gate. 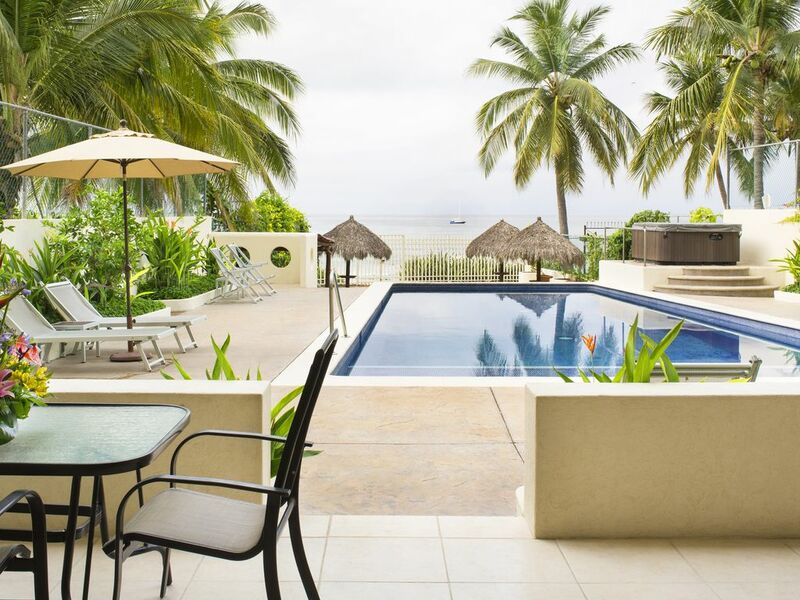 Located at El Farito Condominiums just steps from the ocean’s edge. Pool-level unit makes beach and pool access easy. Port-a-crib provided for families with children. We offer high-speed wireless internet service, satellite TV, iPod docking station as well as free long distance calls to the U.S. and Canada. Open floor plan offers family-friendly, easy, beach style. A spacious living environment with large gathering areas, full kitchen, two bedrooms, and two bathrooms provide lots of room for relaxing. The master bedroom has a king-size bed and bathroom. The second bedroom has a queen-size bed with bathroom. There is also a fully operational laundry room, and plenty of beach towels. Cook meals and make margaritas at home or take a short stroll down the beach to “restaurant row”. Enjoy the pool, barbecue (Weber gas grill), and private terrace all in a picturesque and secure setting. If you like to play golf, the Four Seasons Resort is only five minutes away. If you surf or SUP or are interested in learning, surf rental and instruction can be found walking distance away. There are also guided surf, fishing, whale watching, and snorkeling trips available. This is truly a memorable vacation spot! Just got back from an excellent family vacation. The condo was excellent. VERY large, with a huge sliding glass door that opens to the pool. Everyone staying there was very pleasant. Staff come and sweep the sand in the pool and courtyard every night. Well equipped kitchen and common area barbecue. Couldn't get the oven to work, but that's fine. Didn't try the television. Apparently a big storm blew in in the winter and took away a bunch of the beach sand so it's little rocky now. No big deal! The sand is a little better for swimming with kids a hundred meters to the east. The surf was excellent. Thank you to Alejandra who answered all questions promptly and helped figure out transportation. She's the best. The walk into town is short and easy. I also strongly recommend the pescaderia (fish shop) up the hill, across from the school and football (soccer) pitch. This property has a rare blend of being steps from everything, yet secluded and quiet. Very comfortable and peaceful! We're glad you enjoyed it Dan! Hope you come back next year!! Can't help forgetting your worries once you open the patio doors and set your eyes upon the view in front of you. The view, the Bay of Banderas, and it is breathtaking. The pool is just steps away from your patio and the Ocean only a few more steps. My wife and I have been coming to El Farito in February for the past four years and can't wait to return next year. Mark and Sidney have been easy to work with and Alejandra, who will greet you upon your arrival at the condo, is a Punta Mita delight. The condo is spacious. The living room lends itself to various configurations depending upon your mood. With AC in the living room, and each of the bedrooms, to keep you cool if needed, we find that during the winter months there isn't much need for AC since the temperature is between 70-80 degrees. The kitchen is well equipped with plenty of dishes and cooking accessories. Oh, and the new hot water heater works extremely well, giving you a nice toasty shower. The harbor is a short walk away where you can taxi a Panga Boat out to the Marietas Islands, Whale Watching or even Surf adventures. Continue on pass the harbor and you'll find yourself in the heart of downtown with plenty of small local shops and restaurants to choose from. If you’re up for surfing you’ll find an excellent learners spot directly in front of the condo and you can rent your surfboard just steps from the back gate to the beach. For the more adventurous, downtown Puerto Vallarta is only an hour and twenty minute bus ride away Sayulita to the north is a $20 (us) taxi ride. If you’re looking to relax this condo makes it EASY PEASY! Amazing stay on the beach! Overall the condo was just as the picture displayed. It was spacious and comfortable. The views of the water and surf were outstanding as well as the pool and hot tub. Plenty of fine dining within walking distance. We will definingly visit again. Location was nice and ice stayed in other units at El Farito that were better. The master shower did not work at all, the other shower shot up to the ceiling when fully on and was only warm 2 of our 7 nights so we had mostly cold showers. The AC in second bedroom wouldn’t turn on, The TV didn’t have clear instructions so wasn’t working for us, and the sewage smell came up from the drains in the laundry room and master bath.